An unflattering picture showing the barren nature of the river. Location: East of SW Island and Irenic Ocean. 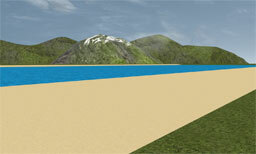 The Besburn River is the longest river in Alphaworld, extending approximately 68.3 miles east from the east end of the Irenic Ocean to Horizon City. The river is quite erratic and takes many crazy dips and turns as it extends along. Residents who are not well off and cannot afford a vacation to Server or Flangton Island often take a cheap vacation to Unused Sand Texture Island which is a small sand deposit at a widening in the river. The river is home to many random settlements for the citizens of Alphaworld.